The modern town of Stocksbridge may only be able to trace its history back to the mid 19th Century, but the area from which it developed has been part of the ancient Chapelry and Manor of Bolsterstone for hundreds of years. Many thanks to Brenda Duffield of the Stocksbridge History Society for this information. This valley between the Pennine hills of Hunshelf and Waldershelf would once be thickly forested. Wharncliffe is mentioned in the opening paragraph of Sir Walter Scott&apos;s "Ivanhoe". Remains on Wharncliffe have been dated back to Roman times and a Mesolithic campsite has been discovered on its edge overlooking the ancient crossing place of the River Don at Deepcar. Always on the very edge of whatever centre of administration governed it, Stocksbridge grew from a tiny hamlet at the crossing place of the Little Don river into a thriving industrial centre during the period we know as the Industrial Revolution. Although this development began on the north of the river in Hunshelf Township, Penistone Parish, it eventually extended onto the south side, which was more accessible. The river, originally known as Hunshelf Water, was later given the name Little Don. The alternative name Porter, thought to refer to its colour at source, is also used by another tributary of the Don, so is best ignored to avoid confusion. Even the name Don was originally Dun - again due to its colour. The river has been diverted several times near the site of the original bridge, which is roughly under the traffic roundabout at the bottom of Smithy Hill. The bridge from which the Town takes it name was a wooden footbridge over the river, which has always formed a boundary between Hunshelf and Waldershelf, the parishes of Penistone and Bradfield. It was destroyed by flood several times and was eventually replaced by a stone bridge in 1812 to cope with heavier traffic. The Stocks, according to recent research by Steven Moxon, may have a much older origin than hitherto believed. In a forthcoming book on the origin of place names, he produces evidence of a connection with monastic buildings and maintains that the 18th Century fulling stocks and tenant John Stocks were coincidental. It was a later mill, also built as a cotton mill in 1794 on the former Stocks&apos; land, which Samuel Fox took over in 1842 and developed into the steelworks which brought prosperity to the district. Initially he used the water power which had been running the nearby Hunshelf cornmill and the mills at Deepcar, but he soon learned to exploit the coal seams in that hillside as machines were developed which used steam power. Other business were soon established here to utilise the clays discovered when testing for coal. John Armitage founded tile and brick factories at Henholmes and Deepcar, Thomas Brookes left him to start his own pipeworks at Bracken Moor, Gregory and Reddish started an enterprise at the Clough, Deepcar. Later William Brooke left his father&apos;s works to set up another pipeworks at Pot House and John Grayson Lowood took over the former chemistry works at Deepcar for a ganister mine and refractory, producing a variety of bricks and basic industrial requirements. Glassware had been produced at Bate Green for a hundred years and pottery near the same side for another thirty in the 17th and 18th centuries. Bolsterstone Glasshouse, as it was then known, although now extremely dilapidated, is the only one of its kind in the country, and covers a furnace of unique construction, which could be a valuable asset in the light of current regeneration initiatives. When Samuel Fox arrived, coal, firestone and ganister were already being mined locally and lead was still being got out of the Bitholmes and Ewden Valley. Some lead miners followed Samuel Fox from Bradwell to work here. Towards the end of the 20th Century, again in line with national trends, the decline in these industries has necessitated a diversification of investment and adaptation to the changing needs of our community. Housing is still being built as Stocksbridge becomes a dormitory town, although the number of inhabitants is declining as more houses are occupied by single people and smaller families. The ridges of sandstone forming Hunshelf and Waldershelf were covered by a thin layer of clay soils, so were never particularly fertile. The resulting poor agricultural yield provided only subsistence for the scattered farms which comprised this Manor of Bolsterstone. However, an attempt was made in the late 1890&apos;s to grow fruit at Hoyle House, with some success. Only a few of the original homesteads survive as working farms, many of the others having been demolished to make way for modern housing, or converted for residential or business use. Remains of 14th and 15th Century cruck barns can still be found at Green Farm, Pot House, Windhill and Watson House. The break up of Bolsterstone Manor in 1802 brought the Manorial system virtually to an end, and more responsibility devolved onto the Parish Council. During the 200 years encompassing our history, the area was then administered in turn by a Board of Guardians, a Local Board, then the Urban District Council - all responsible to the West Riding County Council - and finally, the Sheffield Metropolitan District Council, under which the Urban District became a Town Council with limited powers. 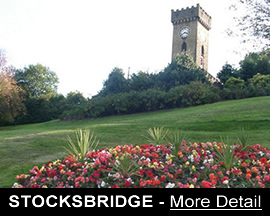 Stocksbridge Town Council responsibilities are now limited to parochial affairs. A handful of Stocksbridge families can claim descent from those named in such documents as the Poll Tax Returns of 1379 and Hearth Tax Returns of 1672 in Bolsterstone, Bradfield, Hunshelf and Midhope. Of the family names recorded in the 1779 Waldershelf Valuation, some descendants can probably trace an unbroken line through more than 200 years. Hundreds more can certainly claim to have descended from those who were drawn to this area by the prospect of work in the new industries of the last 150 years. The Censuses of 1851 to 1891 show that they came from every part of the British Isles and from almost every County in England. While the national population trebled during the 19th Century, that of Yorkshire as a whole increased fourfold and the West Riding alone, almost fivefold. 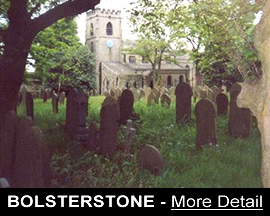 By the half-century, more than a third of the working population of Bolsterstone Parish were tied to the land. The Agricultural Depression of the 1860&apos;s and 1870&apos;s forced many to turn their hands to work in the new industries, and they were joined by refugees from the Holmfirth flood of 1857 and the Lancashire Cotton famine of the 1860&apos;s. Then the building of the reservoirs in Ewden and at Midhope and Langsett in the early 1900&apos;s brought more settlers. In 1950 appeals were still being made for lodgings for workers at Samuel Fox & Co. The Established Church is the Church of England. Our Parish Church was St. Mary&apos;s, Ecclesfield, until the separation of Bradfield Parish in 1650, when people in this area had to attend St. Nicholas&apos; at Bradfield. With the creation of St. Mary&apos;s at Bolsterstone as a chapel-of-ease during the next Century, life would become a little easier for the occupants of the few farmsteads in this valley. Church Registers show that marriages during that period were often solemnised on Christmas Day, the only holiday which a domestic servant and agricultural labourer would have. St. Mary&apos;s, Bolsterstone, was then the only place of worship in the valley, other than the Chapel of St. James the Lesser at Midhope. The nearest Roman Catholic Church was St. Vincent&apos;s in Sheffield. Non-conformists met in various private homes. Their children were baptised at the nearest Non-conformist Chapel, such as Netherfield at Penistone, or by a visiting minister in their own homes. Local Historian Joseph Kenworthy recorded a register of baptisms performed at Spink House by R.C. Minister V. L. Denis between 1800 and 1819. Marriages and burials were required by law to be performed at the Church of England, but eventually the needs of a growing movement away from the Established Church were catered for by the formation of Independent Chapels and a Roman Catholic Church in the 19th Century, with the addition in the 20th of an Assembly of God Pentecostal Church. Many traditions were based on the Agricultural year and the Church calendar. One which survived until quite recently was Caking Night, which was celebrated originally on the night of November 1st, when soul cakes were made and given to callers for All Souls&apos; Day. Ploughing matches were held locally from 1880-1938, attracting nationwide competition. A strong choral tradition began in the Churches. Local Christmas Carols have a popular appeal, most having been composed in the early 1900&apos;s. Choirs 20 to 30 strong used to tour the outlying homesteads throughout the night of Christmas Eve, a custom which died out in the post war period. Replacing that tradition is one which could be called exhibition singing. Dr. W. M. Robertshaw&apos;s St. Cecelia Ladies&apos; Choir competed nationally throughout the 1930&apos;s and the Stocksbridge Congregational (now United Reform) Operatic Society produced Gilbert & Sullivan shows in the 1950&apos;s. Bolsterstone Male Voice Choir was founded in 1934 and is world-renowned. The Deepcar Male Voice Choir, recently disbanded, has been superseded by a mixed choir, named for our ancient land - the Waldershelf. Making music was always part of the local scene, with a piano in almost every household at the centre of every family gathering. Organised bands were as popular as the choirs; Stocksbridge Old Brass Band, Stocksbridge Works Orchestral Section, the Salvation Army Band and the Secondary Modern School Band (now the High School Orchestra), as well as a Ladies&apos; Jass Band. A hillbilly group called The MacDoodles performed on BBC Radio. Dance bands played at the enormously popular weekly dances at the Victory Club throughout the 1930&apos;s, 40&apos;s and 50&apos;s, with the annual Policemen&apos;s and Tradesmen&apos;s Balls the highlights of our social calendar. Dramatic Societies were also a prominent feature of the Stocksbridge cultural scene. Every Church was a natural nursery of talent, unselfconsciously displayed in parades and festivals which marked each cause for celebration. There were formal drama groups, a Pierrot Troupe and Deepcar Follies. Annual Carnivals were held in the 1920&apos;s. The Stocksbridge Works Amateur Dramatic Society is one of the oldest sections of the Stocksbridge Works Social Services, continuing almost without interruption throughout World War II. Other hobbies supported by the Stocksbridge Works Social Services were the Gardening and Photographic Sections, a Pigeon Club and a Poultry and Rabbit section. The oldest game is Knur and Spell, thought to have been brought into this area by the Viking invaders of the 10th Century, and popular throughout the North of England in the early 1900&apos;s.
Rifle Clubs were formed at the turn of the Century, surviving until recently. Individual athletes were able to compete at Sports meetings, originally also organised by the Churches, held annually at grounds at Stonemoor, Bolsterstone and Lowoods field at Deepcar, then from 1912 at Bracken Moor. These meetings attracted competitors from far and wide, reopening after improvement of facilities in 1951 for its 12th Great Hunshelf Steeplechase and Annual Athletic Sports under AAA rules. Every Church also had its Football and Cricket teams, and from these evolved our present competitive Clubs at Oxley Park and Bracken Moor. The Old Cricket Club was founded in 1862. The S.W.S.S. again made it possible for employees and their families to enjoy the sports, subsidised by the firm, of Archery, Badminton, Billiards and Snooker, Bowls, Boxing, Clay Pigeon Shooting, Cricket, Football, Golf, Hockey, Indoor Games, Rifle Shooting, Swimming and Tennis. Many of these activities began before 1939 and had to be suspended for the duration of World War II. The Physical Culture section developed into the extensive facilities enjoyed today at Stocksbridge Leisure Centre. 1802 Sale of Bolstertone Manor - the only property in the catalogue which was identified as being in Stocks Bridge itself was 17 acres, 36 perches, occupied by Matthew Walker and comprising a house, small barn, beasthouse and land. Sheffield Solicitor John Rimington bought the Estate from Lord Melbourne, later Prime Minister, for £35,000. He raised the money by offering their freehold to leaseholders. Many tenants took advantage of this opportunity, but others who could or would not, were evicted. 1805 Opening of the Wadsley and Langsett Turnpike. Previously roads had been maintained by the manual labour of parishioners, who were compelled by law to spend a certain number of days a year in repairing the damage done to dirt tracks by weather and horse transport. Now money was invested in Turnpike Trusts and engineers employed. The toll-bars at Deepcar exacted dues from all traffic passing along the Sheffield and Wortley roads. 1812 The wooden footbridge at Stocks Bridge was replaced by a stone carriage bridge, so vehicles no longer needed to ford the river. 1817 A Terrier (a list of Church properties) includes "a half acre at Stocks Bridge, bounded on the west and north by a small river, on the east and south by the farm of Jonathan Hawke". 1827 The Independent Ebenezer Chapel was built almost on the very edge of Bolsterstone Parish, in the hamlet of Stocks Bridge. 1837 Civil Registration of Births, Marriages and Deaths was made compulsory. Certificates now show these as having taken place in Wortley Registration District. 1841 Census: Of the 871 population of Bolsterstone Chapelry in Bradfield Parish, 34 lived in 5 households in Stocks Bridge. William Jubb was now described as a farmer, John Webster as a coalmerchant, Jonathan Hawke still as a shoemaker. There were also Edward Askew, blacksmith and a household of five single men and a boy in what seemed to be a boarding house. 1842 Samuel Fox came, reputedly on foot, from Bradwell in Derbyshire, seeking premises to rent for the wire-drawing business. 1848 A Local Board of Health was appointed to implement the requirements of the 1842 Health of Towns report. Samuel Fax began production of steel umbrella frames, providing work for hundreds, particularly women. Children were also allowed to work half-time. 1851 Census: The population of the area had grown to 987 in 199 households, of whom 36 lived in the 7 homes labelled Stocks Bridge. The Askew and Hawke families and widow Ann Webster were now joined by George Batty, carpenter, a widowed shopkeeper Hannah Broadhead, two brothers and sister named Helliwell, who we know occupied the cottage and workshop at the bottom of Nanny Hill and the house of Independent Minister George Spencer. Only 16 of them were born locally, including 75 year old Jonathan Hawke, still described as a shoemaker. Samuel Fox, his wife Maria, their son William Henry, their nephew William, two lodgers and a servant were living near the mill on the Hunshelf side of the river, so in Penistone Parish. Mr. Fox was described as a Wire Manufacturer. 1851 The only Ecclesiastical Census showed the comparative attendance at the Parish Church of St. Mary, Bolsterstone, and the Congregational Independent Chapel, Stocks Bridge. 1852 The Paragon Umbrella frame was patented. 1855 Samuel Fox took advantage of fashion and began production of crinoline wire. 1856 The Fox household moved to take up residence in Townend House, Deepcar. A Parochial Valuation of the Township of Hunshelf described the extent and value of his property as being in Stocksbridge. The first houses were built on Hunshelf Bank to accommodate his workers, known as Brick Lump. Deepcar National School was opened. 1858 Stocksbridge Hall was built, on Horner House land, although that district and the whole of the western part of Bolsterstone Parish was still identified as the District of Green, after Green Farm at its centre. 1859 St. Ann&apos;s Catholic Church was built in Deepcar. 1860 Samuel Fox had established a works at Amiens, France, to manufacture umbrella frames. Census returns show that several children were born there, and in Boulogne. The plant was finally wound up in 1914. 1861 Census: Population 1,628. Of the properties named as Stocksbridge, the New Inn, described as a beerhouse, had been built and the Henholmes Farm was included. Joseph Hinchliffe, farmer and carter, Charles Illingworth, farmer and coke-burner, Joseph Kenworthy, farmer and mason - examples of the dual occupations which were typical of the current economy. On the day of the Census, Maria Fox, Manufacturer&apos;s wife, was Head of the Household at Townend. 1862 Saw the formation of the Stocksbridge Band of Hope, the Industrial Co-operative Society, which first met at the Friendship Inn, but was later to give rise to the Stocksbridge Temperance Society. 1863 The Congregational Chapel was built. It was first known as the Salem Chapel. 1867 Samuel Fox built the Works School, sometimes known as the Red School, then as Bramley&apos;s, after a head teacher of that name, and finally as the Co-op School. 1868 The Wesleyan Chapel opened at Old Haywoods, Deepcar. 1869 Stocksbridge National School was built at the bottom of Nanny Hill. It was used as Church and School until St. Matthias was built in 1890. From 1920 it was known as a Church of England School. 1870 Deepcar St. John&apos;s Church was built, daughter Church to St.Mary&apos;s, Bolsterstone. 1871 Census: The population of Stocksbridge Sanitary District, which now included parts of Hunshelf, was 3,725. On the day of the Census, Samuel Fox, Steel Manufacturer, was alone at Townend with a visiting niece and two servants. Stocksbridge inhabitants included Harriet Batty, Innkeeper (Friendship Inn), Joe Hepworth, Stationer and the Rev. Henry Robertshaw, Independent Minister. 1872 Stocksbridge Sunday School Union was formed. From this date combined Whitsuntide Processions were held. 1873 The Stocksbridge Local Board was elected to administer the new Sanitary District of Stocksbridge and issued Byelaws to regulate the use of the new water supply. Samuel Fox had campaigned for this change because of the Industrial Rate which he had to pay to Penistone Parish, while Bolsterstone Parish had the expense of maintaining access roads to the Works. Of the 11 members elected, 6 were farmers, proving that Agriculture was still of great importance, while 2 were the principal manufacturers Fox and Armitage. 1876 The Ebenezer Chapel came into use as a day as well as a Sunday School and the manse became the schoolhouse. 1877 A rail link with the Manchester, Sheffield and Lincolnshire railway enabled Samuel Fox to transport his products directly, avoiding the road tolls which he had had to pay at Deepcar. The Stocksbridge Railway Co. was formed. Until 1931, when bus services were provided, employees and Penistone Grammer Scholars were allowed to use the line, at their own risk, from the station near Smithy Hill. The terminus at Horner House was later to be used for supplying materials for the construction of Langsett and Underbank Reserviors. 1881 Census: The population of S.U.S.D. was 4,660; of the area covered by the 1851 Census 3,737. An estimate of the native population, less than one-sixth of the 36 in Stocks Bridge in 1851, only 4 survivors. Dr. Herbert Ward was our first resident doctor, at Stocksbridge Hall. Samuel Fox, Steel and Umbrella Manufacturer, was Head of a household of six servants. Maria and William Henry now lived in Oxfordshire. 1887 Samuel Fox died and was buried at his home North Cliffe in Market Weighton. He left a considerable personal fortune, having already established a Benefit Fund for employees, and had housed his workforce on Hunshelf Bank in Gentleman&apos;s Row. Derbyshire Row, Goit Terrace and Ford Lane; and at Horner House on Bessemer Terrace, Springmill Terrace, Pearson Street and Langsett Terrace. 1890 St. Matthias&apos; Church was built as a memorial to Samuel Fox. 1891 Census: The population of Stocksbridge, Deepcar and Bolsterstone had risen to 5,677. 1895 The creation of Stocksbridge Urban District Council. Its boundary now the top of Hunshelf Bank and its population thereby increased by 1,100. 1896 The sale of Stocksbridge Water Rights to Sheffield Corporation. 1897 Underbank Reservoir was begun, completed 1907. Samuel Fox had always opposed the damming of the river since the disaster at Dale Dyke in 1864. 1901 Census: Population calculated at 6,566. 1902 The Stocksbridge Works Institute, later known as the Miners&apos; Welfare, was founded as a reading room, with baths and billiards. 1903 Tom Batty built a new facade on the Friendship Inn. 1907 Wood Willows built by S. Fox & Co for its workers; George Thickett, foreman, being housed in the villa opposite. 1912 The Works canteen was built, which would later become the Victory Club. 1913 The Workers&apos; Educational Association established classes for adults. 1917 Stocksbridge Parish Church acquired its first Vicar and the first wedding took place there. The end of the Great War enabled building to recommence. Garden City was completed with a fruit tree in every garden from the former Fruit Farm. 1921 A national coal strike put 3,000 local miners out of work for 6 months. The Palace Cinema took the place of the Electric Theatre on Edward Street. 1923 The Urban District Council took over responsibility for Stocksbridge Fire Brigade, previously manned and run by volunteers. The Clock Tower Memorial was built to the 107 young people, a nurse, sailors and soldiers, who died 1914-18. 1924 The first estate of 94 council houses was built at Shay House. 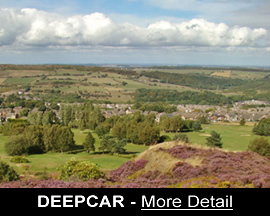 1925 Steel houses were built at Deepcar at a cost of £400. 1928 A Town hall was built to replace the old Council offices. 1929 The Council School was built - called the New School - in Shay House Lane and the Works&apos; and the British Schools were closed. It comprised Infant, Junior and Senior departments. 1933 The first 20 houses were built at The Royd. 1937 Work began on the 180 houses of Glebelands Council estate. 1939 The outbreak of World War II for many meant garaging the family car and taking a munitions job to avoid Military Service. 1940 The Sheffield Blitz on the night of 12/13th December, viewed from the safe distance of Stocksbridge was like Bonfire Night. All told, only 6 bombs are believed to have dropped in this valley, which seemed to be at the end of the bombing run, and these may have been jettisoned rather than deliberately aimed at the Works. 1943 The Day Continuation scheme was inaugurated for all boys employed by Stocksbridge Works, aged 14-16, to attend one full day a week without loss of wages. 1944 The Cemetery was opened on Bocking Hill. 1945 Spink Hall estate of 80 houses was begun - foundations dug by German P.O.W.&apos;s. Another 51 names were added to the War Memorial. The Roll of Honour in Fox&apos;s Works commemorates 39 former employees. 1946 Dr. W. M. Robertshaw&apos;s Annual Report for the Ministry of Health revealed that S.Fox & Co now employed more people than the entire population of 50 years previous, comparative population figures being 6,021 in 1893 to 9,795 in 1946. Prefabricated bungalows were built by the Ministry of Works in Pot House Lane and at Wilson Road, Deepcar. 1947 October 18th. A coach carrying members of the Bolsterstone Male Voice Choir to Holmfirth crashed with the loss of 9 lives and many injuries. 1950 Stubbin Estate added 388 to the Council housing stock. 1953 A Ministry of Health report assessed the population of Stocksbridge as 10,220 - an increase of 100 in 12 months. 1955 An Infant School was built at Pot House. 1960 East Whitwell, an estate of 400 houses, completed our council house building. 1963 The new Junior School opened in Cedar Road and the Shay House site became a Secondary Modern. 1965 Stocksbridge Rugby Union Club was formed. 1966 Stocksbridge College in Hole House Lane, was opened by Prime Minister Harold Wilson. 1967 With the nationalisation of steelworks, S. Fox & Co became part of the British Steel Corporation. 1968 The Central Library was built, replacing demolished housing on Button Row. 1970 Stocksbridge Swimming Pool was built in Oxley Park, largely due to the efforts of local people and the Urban District Council. 1973 The Sports Centre building was added by the Urban District Council. St. Ann&apos;s Roman Catholic School opened in McIntyre Road. 1974 Abolition of the West Riding and creation of South Yorkshire, but Stocksbridge Urban District and the Civil Parish of Bradfield were now included in Sheffield Metropolitan District. 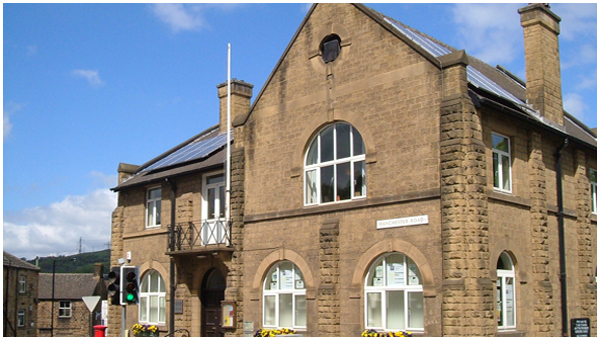 The Urban District Council became Stocksbridge Town Council. 1985 The Assembly of the Pentecostal Church moved from its temporary home in Deepcar Community Hall to the top floor of the Stocksbridge Co-op building. 1986 BSC Stocksbridge Works became part of United Engineering Steels. 1988 Stocksbridge College became the Stocksbridge site of Loxley College. Stocksbridge Rugby Union Football Club bought the old chapel on Manchester Road and converted it into a licensed clubhouse. 1991 Population 13,619. The number employed in the steelworks had dropped from 6,500 at is peak, with 85% of our population dependent on it, to 1,400. 1995 British Steel acquired all assets of United Engineering Steels, the Company now trading as British Steel Engineering Steels. 1997 The Steel Valley Partnership grew out of the Steel Valley Forum, its purpose to formulate a bid for funding from the Single Regeneration Budget. 1998 The College was closed and demolished. The former Co-operative building on Manchester Road was converted for use by Sheffield College and W.E.A. classes, with a creche. 1999 Stocksbridge Works now has three separate sites under different ownership: Bridon Wire at Sheephouse, Corus Alloys and Special Steels and Avesta-Polarit Stainless. 2000 We celebrated the new millennium with fireworks. At least one old lady thought war had broken out. 2001 Stocksbridge Training and Enterprise Partnership installed at the refurbished Community Centre with workshop and office space at Deepcar. Steel Valley Forum meets regularly to voice the concerns of the community and act as liaison between us and the executive of the S.R.B. board. 2002 The new Co-op opened in September. The Miners&apos; Welfare building, now Stocksbridge Training and Enterprise, celebrated its centenary. May 2nd - The funeral of Fr. J. P. Callanan was held at St. Matthias - the only time the traffic in Stocksbridge has ever been completely held up. 2003 Corus announced proposals to transfer steel melting processes from Stocksbridge Works to Rotherham Works, entailing the closure of the Melting Shop and the Hot Rolling Mill, with the loss of 350 jobs.